I never learned how to cook artichokes at an early age because it was not something growing in our garden. I never even knew what artichokes were until after I married; quite a few years later. As I have often told you, Dad always said, “If we do not grow it we do not eat it.” Well, this is how it was with the artichoke. I really didn’t know what I was missing by not learning how to cook artichokes. That probably was a good thing! The first time I ate them was the very first recipe below; it is absolutely fabulous! I was hooked immediately! I learned how to cook spinach very early in life. I loved spinach combined with many other vegetables like in a recipe for tomato soup. 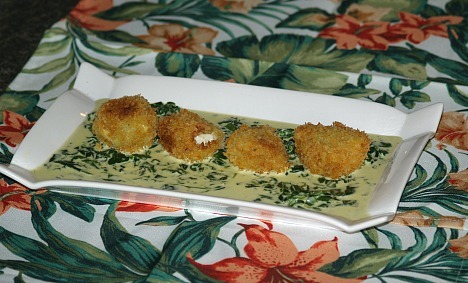 When I tasted this stuffed artichoke recipe with the wonderful cream spinach sauce, I could not believe my taste buds. I decided I needed to learn how to cook artichokes. This one recipe led me to using them in many of my vegetable recipes which I had already been preparing. I often add them to one of my cucumber tomato salad recipes and sometimes in my eggplant recipes. You will be surprised how well they blend into some of the corn dishes or bean recipes also when you learn how to cook artichokes. Since my first experience of learning how to cook artichokes I have also learned a lot about this vegetable. The one type we use in cooking is the “globe” artichoke. The reason Dad never grew them is that they do not do well in my Ohio area so this is why I never learned how to cook artichokes. Here in the United States the state known for them is California where almost one hundred per cent are grown for this country. The nutritional value of vegetables generally speaking are all pretty good. The artichoke nutrition includes the “flower heads” which has the highest total antioxidant capacity of any vegetable. This diuretic vegetable exhibits an aid to digestion which strengthens the functions of the liver and gall bladder. These great qualities should lead anyone to give this delicious vegetable a try to learn how to cook artichokes. 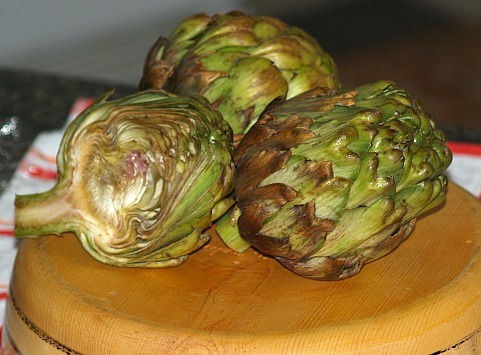 NOTE: Do not confuse artichokes with the Jerusalem artichoke; they are not alike at all. The Jerusalem artichoke is not even a type of artichoke but a tuber instead. These are important tips when learning how to cook artichokes. Add about 2 tablespoons lemon juice (to retain color) in about 8 cups of water. Bring the water to a boil and drop in the artichokes. After the water returns to a boil reduce the heat and simmer uncovered until artichokes are tender when touched with a fork and the leaves pull out easily. The leaves of the cooked artichokes are pulled out one at a time and the base can be eaten with your favorite sauce like a hollandaise sauce recipe or just mayonnaise. After boiling, these can be used in many recipes. 3 Pounds canned whole artichokes (I used 1 1/2 jars from SAMS) Drain well. Blend the Gorgonzola cheese; garlic, 1 cup of the heavy cream and white pepper (should be like peanut butter). Spoon mixture into center of artichoke heart; freeze for 2 hours. 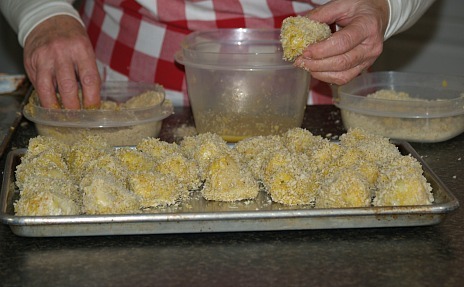 Roll artichokes in Italian bread crumbs then eggs and then the Panko bread crumbs. Combine in a sauce pan over medium low heat, remaining heavy cream, egg yolk, butter, Romano cheese and spinach; stir until thickened. Pour the mixture over the fried artichokes and serve. Remove any discolored leaves and the small leaves at the base of the artichokes. Cutting straight, slice one inch off the top and discard. Snip off points of remaining leaves. Heat water, ¼ cup of oil, lemon juice and ½ teaspoon of salt in a 4 quart pan. Carefully remove artichokes from the water using a large spoon. Place upside down to drain. Gently spread leaves apart and remove choke from the center of each artichoke with a metal spoon. Mix remaining ingredients and pour into the artichokes. Refrigerate at least 12 hours. Serve with marinade in the center. Bring chicken broth to a boil in a medium saucepan. Add the rice, cover, reduce heat and simmer for 20 minutes or until rice is tender and broth is absorbed. Drain artichokes, reserving the marinade. Chop artichokes and combine with rice, green onions, green peppers, celery, parsley and olives and stir well. Combine reserved artichoke marinade, mayonnaise, curry powder, pepper and stir well. Add marinade mixture to the rice mixture and stir well. Melt ½ of butter in skillet and add onions and lightly brown; remove onions and set aside. Melt remaining ½ of butter; stir in toasted bread crumbs. Drain artichokes and reserve liquid; mix artichoke hearts, mushrooms and onions in mixing bowl. Melt 1 cup of the cheese in the cream of mushroom soup in saucepan. Add wine and ¼ cup of the artichoke liquid to the saucepan. Pour mixture over the artichoke hearts and mushrooms mixture; mix well. Put in greased casserole baking dish; sprinkle top with buttered bread crumbs. Top with remaining cheese and bake in preheated oven at 350F degrees for 45 minutes. This is one of the artichoke appetizer recipes which are more expensive to make but it is so delicious; great for special occasions. Sauté bell pepper in oil in skillet over medium high heat until lightly browned; place in mixing bowl. Add artichokes, mayonnaise, Parmesan cheese and green onion; mix well. Blend in Worcestershire sauce, jalapeno peppers, lemon juice and celery salt. Fold in crab meat; season with salt and pepper mixing well. Spread mixture in 8 inch pie plate; bake 20 to 25 minutes in preheated oven at 350F degrees. Serve with thin slices of toasted French bread. When I learned how to cook artichokes I quickly realized that large party appetizer like this recipe are very popular for parties. Combine and blend well cream cheese and green onion tops; set aside. Stir together artichoke hearts, Parmesan cheese, garlic, olive oil, lemon juice and ground red pepper. LINE a 4 cup bowl with plastic wrap; spread 1/3 of cream cheese mixture on bottom. On top of cream cheese mixture place a layer with half of the chopped roasted red peppers. Next make a layer with ¾ cup of the artichoke mixture; spread another layer of cream cheese mix. 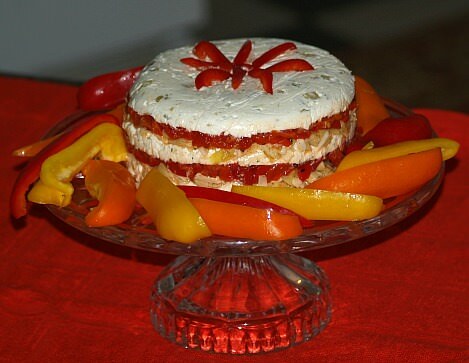 Continue layering with roasted red peppers, artichoke mixture and the remaining cream cheese mixture. Unwrap top and invert on a serving plate; remove bowl and the plastic wrap. Garnish with bell pepper and radishes; serve with toast triangle.